This article explains the Adams Equity Theory, developed by John Stacey Adams in a practical way. After reading it, you will understand the basics of this powerful motivation theory. What is the Adams Equity Theory? The Adams Equity Theory was developed by the American psychologist John Stacey Adams in 1963. It’s about the balance between the effort an employee puts into their work (input), and the result they get in return (output). Input includes hard work, skills, and enthusiasm. Output can be things like salary, recognition, and responsibility. A proper balance between input and output ensures that an employee feels satisfied and motivated, contributing to their productivity. Even though Adams’ theory is over 50 years old, it’s still relevant today. 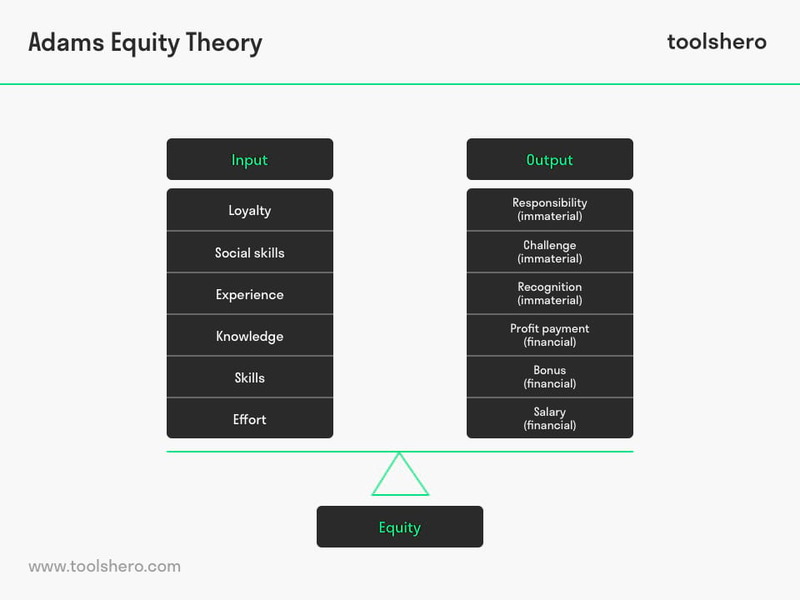 It’s very important for organisations to understand how the Equity Theory works. This can help create an effective company structure in which employees are encouraged to carry out their work with conviction and passion every day. Similar to common theories on motivation like those of Maslow and Herzberg, Adams acknowledges that subtle factors influence how employees view their job and how they carry it out. Adams is convinced that employees lose motivation when they think or feel that their input is greater than the output. The Adams Equity Theory shows why salary and benefits alone don’t determine an employee’s motivation. It explains why a promotion or raise rarely has the desired effect. It can even undermine the motivation of other employees. Employees place great importance on being treated fairly and equally. This ensures that they’ll be motivated at work. It’s treating different employees differently and unfairly that leads to bad blood and will damage a lot of people’s motivation. After all, we all wanted to be treated fairly. When that’s not the case, employees will be unhappy, which can manifest itself in different ways. For instance, they won’t perform optimally, and there’ll be a risk of high employee turnover as employees choose to try their luck at another employer. That’s why fair treatment of everyone involved is essential. Every day employees make an effort by coming into work and carrying out their job and tasks. No effort means no work. It’s the most basic level of input. Employees have skills they use to carry out their job competently and professionally. They’ve gained these skills through training and experience. This is valuable input employees accrue through schooling and training, being interested in their field, and by developing and evolving. Employees can’t make good use of their knowledge without experience. That’s why experience is considered to be very valuable input with a remarkable characteristic. Moreover, experience can’t easily be replaced. Employees take part in company outings, celebrate each other’s birthdays, and are able to create pleasant working conditions by engaging each other in conversation. By treating each other with empathy, employees ensure that they’re part of the group and therefore the organisation as a whole. Acceptance is also part of this. By accepting and tolerating the behaviour of others, employees can foster mutual respect. This includes everything related to personal sacrifice. An employee who remains loyal to his organisation, despite a job offer at another organisation, is loyal. Employees who work late every day and sacrifice their own free time are loyal too. Employees’ output can generally be divided into 1) financial rewards, 2) immaterial rewards. The most common forms of output are discussed based on this division. This is considered the most important output for employees. In return for all their input, they get a fixed amount of money that’s paid by the company every month. The extra money on top of the salary as a bonus is also considered a financial reward. Bonuses can be based on commission or targets. The harder an employee works, the higher this bonus. Profit sharing also falls under this type of output. When the whole organisation and all its employees work hard, this results in a shared reward at the end of the year. Employees want to be intrinsically motivated. This means they feel it’s important that their hard work is recognised. When a co-worker takes credit for an employee’s work, this leads to a massive imbalance in the Equity Theory. It’s important for managers to be aware of this factor and actively give employees the recognition they deserve. Employees enjoy interesting and important challenges in their work. This makes them feel proud of the work they do and committed to the organisation. This ensures employees experience a sense of ownership and control in their work. This responsibility makes them feel confident and gives them the freedom to organise and carry out their work as they see fit. As a result, responsibility leads to intrinsic motivation. The employees feel that they matter in the organisation. The core of the Adams Equity Theory is that there needs to be a balance between employee input and output. What an employee brings to an organisation needs to be relatively equal to what they get out of it. In return for a monthly salary, employees bring knowledge, skills, effort, experience, loyalty, and much more to the table. When their input outweighs their output, there’s an imbalance, and the employees will be unhappy. They’ll feel that they’re not being treated fairly and will feel disillusioned with the organisation. That may lead to demotivated behaviour, recalcitrance, calling in sick, or finding other employment. Every employee will attempt to maintain a balance between their input and output. That’s the foundation of the equity principle; people look for fair and equal treatment. Balance in the Equity Theory offers ways to help motivate employees. By engaging them in conversation and finding out what motivates them, supervisors will be better able to inspire employees and increase productivity. Finding equitable and just treatment is something that is always relevant for employees. They’ll always compare their own efforts (input) and the rewards they get for this (output) to their co-workers’ input and output, striving for equity. This despite the fact that employees are aware that different types of effort and skills are required for different levels and are therefore rewarded differently. Regardless, employees should not be made to feel that they put in the same amount of effort as colleagues at higher levels without being paid the same salary. This means that when tasks are delegated to lower-level employees, this needs to be rewarded fairly in order to keep everyone happy. The constant comparing of input and output makes the Adams Equity Theory complex. Adams calls this ‘referent’, meaning employees use each other as reference points. What do you think? Could you use the Adams Equity Theory to motivate your employees? How would you apply it? Do you already use the Adams Equity Theory and do you have tips and tricks or additions?